Combine power, flexibility, comfort, and reliability and you get the highly rated 1.00HP Bosch PR20EVSK variable speed router. It has the highest horsepower with regard to small routers and has a variable speed of 16000 to 35000 RPM. It is easy to use with a collet that accepts 1/4 inch bits and offers the maximum diameter of 5/16 inches. It has a durable and rugged aluminium base and a one-hand easy to handle grip for easy and stable operation. Bosch PR20EVSK is regarded as a versatile router, manufactured by Bosch. This router is quite powerful and has a compact design. Most people mistake it to be just an ordinary laminate trimmer, but this is more powerful and has more functions than a laminate trimmer. It is an ideal tool for mortising hinges, slot cutting, deck plank trimming and decorative inlays among other functions. 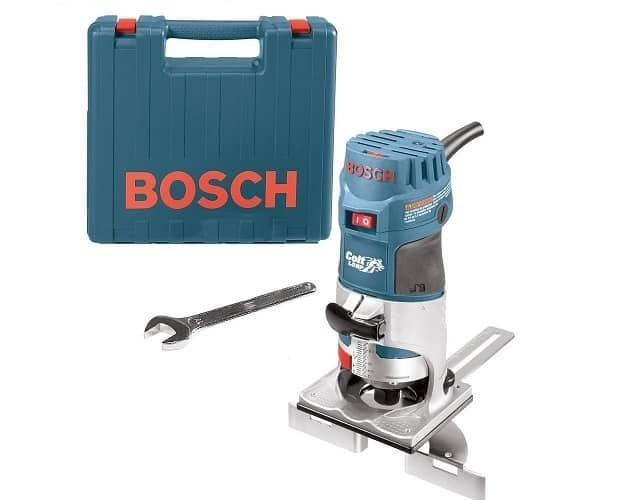 What make Bosch PR20EVSK high quality? Variable Speed: Delivers a variable speed of between 16000 to 35000 RPM making it one of the most powerful and versatile routers in the market. With this variation in speed, the user is able to handle a variety of routing tasks and materials with ease. Powerful motor: It comes with a 5.6 Amp motor that delivers a maximum power output of 1 HP and comes with a soft start feature which lowers the start up torque. The router may be small but with this power, it can handle tasks done by bigger routers. Enhanced Bit Capacity:It’s fixed base accepts bits as small as 1-5/16 inches making it perfect for a variety of routing jobs. Macro and Micro Adjustments: It comes with macro and micro fine adjustments that make it possible for the woodworker to fine-tune the router and achieve accurate and precise cuts. Fixed Base: It has a fixed base as its special feature. It comes with a wheel attached to its outer side or back of the base so has to facilitate precise depth adjustment. Depth Adjustment: Its depth adjustment is quite easy to use and is versatile and precise. This gives the user full control of the project. Its front spindle lock on the motor facilitates easy single wrench bit changing. A wheel at the back of the base: Makes micro-fine depth adjustments so much easier. Clamp System: Has a clamp system that facilitates easier adjustment of the motor in order to suit the specific load. Excellent grip: It is made in an aluminium construction making it easy to hold and operate. With the Straight-Edge guide, the wood worker can get accurate cuts. It’s fixed base is made of durable aluminium material. It has finger support pockets for maximum stability when trimming edges. It has a Constant Response Circuitry for consistent speed and prevention of overload. Comes with other essential components such as drop-forgedcollet, palm router, and wrenches. It has a variable speed for maximum versatility. Has a straight-edge guide for accurate cuts. Its rugged aluminium case is easy to clean and is durable. Has a precise and accurate depth adjustment system. To achieve consistent speeds, it is fitted with a Constant Response Circuitry. 6 Amp motor is very powerful. Complicated to use for beginners. Its base is rather slippery. Only has a fixed base hence cannot perform some plunge base duties. It is tasking to adjust the depth since it is hard to locate the adjustment wheel located at the back of the base. The Bosch PR20EVSK router has a detailed manual that explains how to use it. There are carbon brushes that are accessible to users. You should use the finger pockets when handling the router so as to enhance stability. You can use the wheel at the back of the base to adjust the depth that you require for your cutting tasks. The variable speed dial is used to adjust the required speed depending on the load that is to be trimmed. With the Constant Response Circuitry you do not have to worry about speeds fluctuating during routing as this will help maintain a constant speed all through. The router user manual provides some basic guides for purposes of maintaining and repairing the router. Once you finish using the router, you should clean and wax it before storing it in the case. As far as repairs are concerned, you should be cautious so as not to cause more damage. It is advisable to let the experts handle your repairs unless it involves minor repairs.